The second stage of a translation project involves checking by the team. In this second stage you will use many tools to ensure that you have been consistent in your translation. 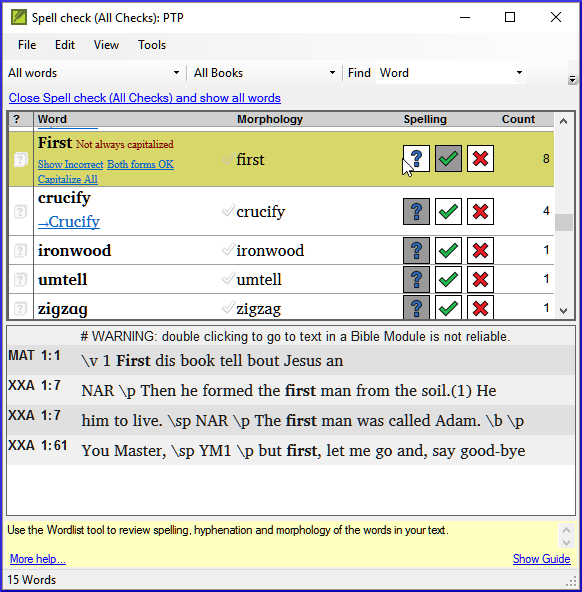 You will read through your text, work on proper names, Biblical key terms, spell checking, and formatting checks. You will also print out a draft and use a variety of notes: project notes, spelling notes, Biblical terms notes to record your questions, discussions and decisions. 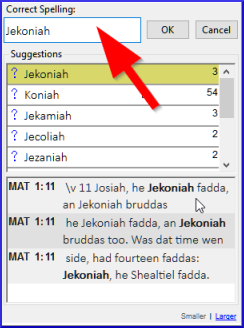 filter the Major Biblical terms list on Names. 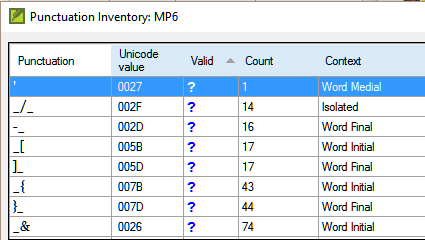 use the Adapt Names tool to enter your transliteration rules for each letter. edit and approve the individual names. add the approved names as proposed names in the Biblical terms list. work through the Biblical Terms list to ensure that all the verses are consistent. Click the Comparative Texts button on the toolbar. Choose your reference text, then click . 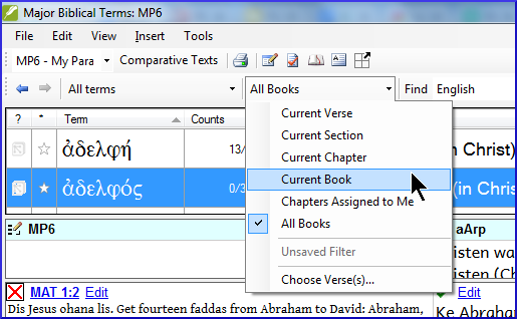 Note : The terms column is in Greek (or Hebrew) by default. 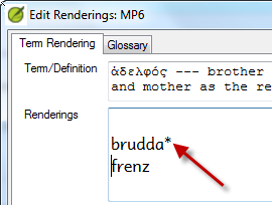 You can see the terms in a roman script by using the View menu and choose Transliterate terms. 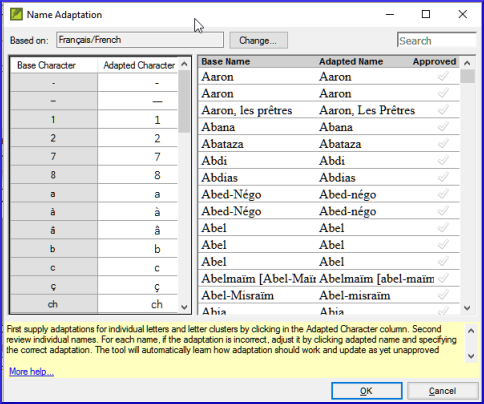 In the left pane, fill in the “Adapted Character” column for individual letters or letter clusters. Work through the Adapted name column in the right pane. Once the name is correct, click in the "Approved" column. You need to work through the list and confirm that all the verses use the name consistently. Click the name in the top pane. Click on a verse in the lower pane which doesn’t have the proposed form of the name. There are times when a verse is correctly translated even though you haven’t used the name. For example, a pronoun is used instead of the name. In this case you need to tell Paratext 8 that it is correct (that is, deny that the rendering is missing). Click the red cross at the left of the verse reference The cross turn into green tick (check) with a red cross . Note : Paratext 8 doesn’t find names in the introductions, headings, footnotes, captions or glossary. To transliterate proper names, you the ___ list on names. Then use the _ menu and __ command. After entering the _ changes then the adapted names. Paratext 8 then enters a __ rendering for all the names. You then work through the list _ and/or adding renderings and making sure that all verses are _. You can add a rendering by selecting the text and pressing Ctrl+__. If a pronoun is used you can __ the rending by clicking on the . This module explains how to check for spelling mistakes in the text you have typed into your project in Paratext 8 . You have type your text in Paratext 8 and have done some checks but there may still be spelling mistakes in the text. It is important to correct any spelling mistakes so that your text will communicate clearly. Paratext 8 has a number of specific checks that you can run on the wordlist. It can also highlight invalid characters in you text. The number is the number of times the words must appear to automatically mark it as being spelled correctly. The default is 100 but you can choose more (if you have doubts about the text) or less (if you are confident about the acuracy of the typist). A list of words is displayed. Click on a word in the top pane. If the word is incorrect, but Paratext 8 has suggested the correct word, then click the blue link for the correct word. If the word is incorrect, and Paratext 8 hasn’t suggested the correct word, click on the red checkbox and correct the word. Depending on your language, tick or untick « Ignore all diacritics when comparing words ». Correct the words (as described above). A progress meter is displayed initially, then all the words that are either unknown or incorrect have red squiggly lines underneath. Paratext 8 will underline in red the words that have not been approved in the word list. This either means that the word is misspelled or unknown. You must decide. When possible, it is better to use the spelling check even when making minor corrections as Paratext 8 will remember the correction and you can apply the correction if it happens again. A window appears with a list of some words in the current book. Click « More items available » to see additional words. Make the corrections as needed. Click "More items available" to see more words. This runs all of the checks. This is very useful as it will find all types of errors and even words with multiple types of errors. A list of words is displayed with a link to the capitalised form. Click the appropriate blue link. A list of words is displayed with links to other words which are similar but only have one letter different. A list of words is displayed which have unsual combination of letters (such as consonant or vowel clusters …). A list of words is displayed with links to other words which are the same except for the diacritics. 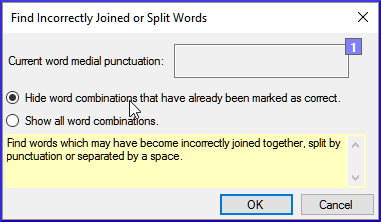 A list of words is displayed which have the same type of problem which have already been corrected in other words. E.g. if you have already corrected "teh" as "the", and it finds "tehm" it will suggest "them". 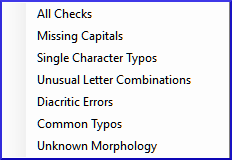 A list of words is displayed which the computer has not been able to guess the morphology based on other words. A list of words is displayed with similar words grouped together. Click the correct spelling status. 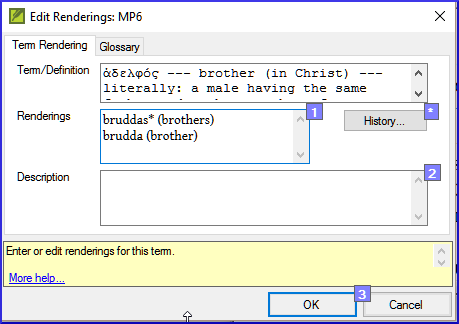 Find all the ways you have rendered this term, and enter them in the renderings dialog. Choose which rendering is/are best, and record why it is best. Document why you rejected the other renderings. Clean up your translation by making this rendering consistent throughout your translation. (Make Consistent, Standardise, Normalise, Harmonise). Repeat with next Biblical Term you find in the Biblical Terms Renderings window. Is there a tick in the found column? If there is a tick, your verse uses the term and you can continue with the next term. If not, you need to either correct your text or add the new term you have used (see below). Select the rendering of the term in your text. Double-click in the renderings cell. The edit renderings dialog is displayed. Paste (Ctrl+v) the rendering in the dialog box. 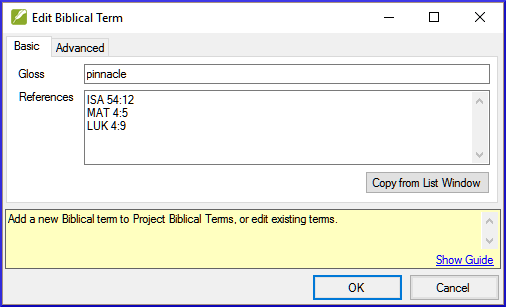 Add renderings for the term from the verses until the terms in all verses are been identified (see below). Continue until all terms for those verses have been identified. There are times when a verse is translated without using the actual term. For example when a pronoun is used. In this case you need to deny that it is an error. If you click on the cross by mistake, click and it will return to . Double-click on the term in the top pane. The edit rendering dialog is displayed listing all the renderings that have been added. Select and cut the other renderings. Type in the reason why the others were rejected and why the first was the best. Edit the renderings as needed. Change the filter so that all the published books are displayed. Clean up verses as necessary. Assign the note as necessary. There will be terms which are important for your language and culture that are not in the list. You can add these terms to your project list. From your reference text, do a find (using Edit > Find) and search for the term. 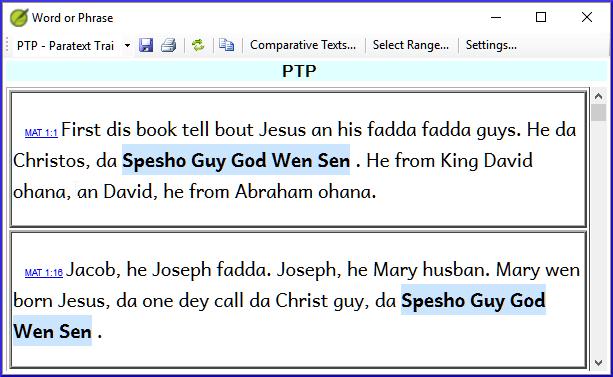 A list is displayed showing the verses with that term. In this module, you will search for a word or phrase in a project and compare it with the translation of that word or phrase in another project.Why this is important? In Paratext 8 (and above), you can see where a word or phrase is found in one project and compare it with the equivalent word or phrase in one or more other projects. For example, you can see where "roi" is found in a French project and compare it with "rey"in a Spanish project. use the checklist “Word or Phrase” from both the text and also from the Biblical Terms Too. 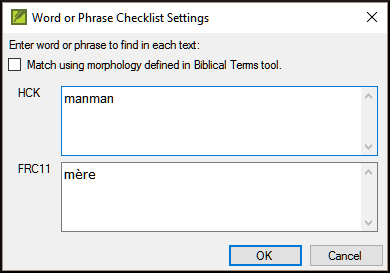 From the Tools menu, point to Checklists, and select Word or Phrase. The Parameters dialogue is displayed. Click OK A window is displayed. Choose the texts that you want to compare and click OK. The « Settings » dialogue is displayed. 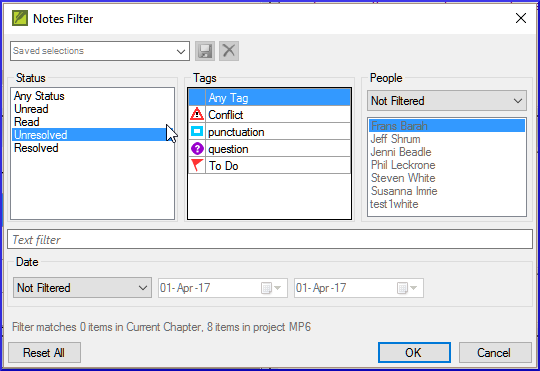 Type the word of phrase that you want to compare in the textbox for each of the projects, then click OK. A window is displayed with a button "Hide matches" on the toolbar. Click on the "Hide matches" button to show only those references where there are differences. The list shows the verses which contain matches in only one of the projects. The word or phrase is highlighted in light blue. Click on the tool icon The Setting dialogue is displayed with the rending filled-in. In this module, you will learn to do several other basic checks (Characters, punctuation, capitals, and repeated words. 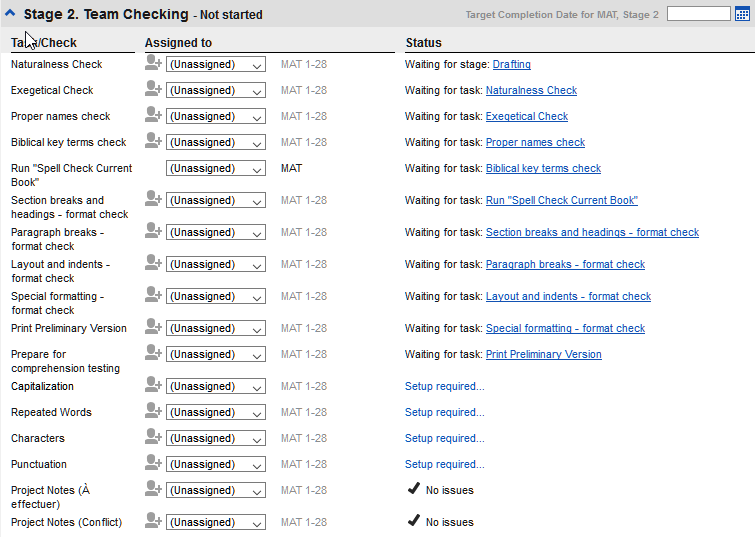 As in the first Basic Checks module (6: BC1: Basic checks), it is easiest to run these checks from the project plan. However, if you want to check several books, you will need to use the Verification menu.Where are we? You have typed your translation in Paratext 8. Be sure that you have checked the chapter/verse numbers and markers, as described in 6: BC1: Basic checks, before continuing and that your administrator has either completed the setup of the checks or is with you to do the setup now.Why this is important? Note: Before you can run these other basic checks some form of setup must be done by your Administrator. The required setup may be an inventory, some rules or settings. These inventories show what is currently in your text, that is, both the good and the bad. You need to work through the inventory and tell Paratext 8 which elements are correct (valid) and which are errors (invalid). Once you have finished the inventory you will be ready to do the check. From the Checking menu, choose the appropriate inventory (for example Character inventory). Click on an item in the list in the top pane. The verses are shown in the bottom pane. For each item in the top pane, choose either Valid or Invalid. Click OK. A list of errors is displayed. Make any corrections as needed. Note: Instead of using the mouse, you can use Ctrl + y to mark an entry as Valid or Ctrl + n to mark an entry as Invalid. This inventory helps you identify all the incorrect characters, i.e. the characters which are not in your alphabet. For each item, choose Valid ou Invalid. Make any corrections as needed.. Check each punctuation mark in its context. The contexts can be: word initial, word medial, word final or isolated (space before and after). If the list is empty, then there are no errors. For each item, choose Valide ou Invalid. It is possible to make minor corrections from within a displayed inventory. However it is preferable to use the Wordlist or the spell checker to correct all the errors at once. There are many basic checks in Paratext 8. The table below summarizes the setup needed for each of the checks. It is possible to run all the checks at the same time, however when running the checks for the first time it is better to run them one at a time to avoid large list of errors. A New Testament contains more than just chapters and verses. There are also titles, section headings, and several types of paragraphs. These checks allow you to be sure that the layout of your text is correct, and your titles etc. are consistent.What are you going to do? When you have finished with the list, close it by clicking the X at the top right corner of the window. Make any corrections by clicking on the blue Edit link. Click on the blue verse reference link. Make any corrections in Paratext. Return to the checklist by clicking on the icon on the taskbar. Choose your reference text as a comparative text. 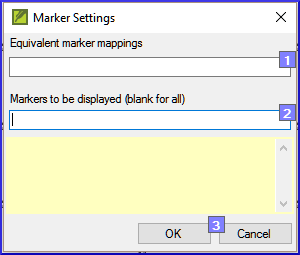 Type in the markers to check. Make any necessary changes (see below). See the list of passages with special formatting Appendix A. Add the USFM as necessary (see module KD or help if necessary). You will first produce a PDF version of your translation, which you can print or share with others (including non-Paratext users). If necessary your can copy the PDF file onto your USB stick and take it to a computer with a printer. Make sure you have completed a markers check before printing a draft. Check that your project is selected. Choose which book(s) and chapters to print. Choose what you want in the Running header (the text at the top of the page). Make any other choices as needed. Click OK and wait, the file will open in your PDF reader. If there are marker errors, a message box will appear. Click No, then correct the errors and try again. There are many ways to copy files. One method is described below. Hold the Windows Key and type E Windows Explorer opens. Go to your My Paratext 8 Projects folder. You are typing or revising your text, wordlist or keyterms and need to make comments on an issue you have seen. Attention: Notes and footnotes are very different. Footnotes are printed in the New Testament whereas notes are for questions and comments and are not printed in the New Testament. add spelling notes to the wordlist. Tip: Don't have too many icons! Icon has a border and a yellow background color. The note has a least one unread comment. Icon is red, purple, or light blue. A project note assigned to you, or to the whole team, or unassigned. Icon is gray. A project note assigned to someone else. Icon is gray with a green tick. A project note with resolved status. Icon is a light blue plus. A consultant note. Icon is a light blue globe. A global consultant note. Icon is a black exclamation point within a red triangle. There is a Send/Receive merge conflict because two users have made different changes to the same verse. Click on the Add Tab button A new line is added. Continue for any other new notes. Click in the text where you want the note (and select any appropriate text). Click OK. An icon is displayed beside the text. Click OK. A note window opens. Adjust the filters as needed. Click the icon( ) in the text The note opens. Type your comments in the textbox. Resolve or assign the note as needed. Click the arrow to collapse the note. Click the icon ( ) in the text. Click OK again to close the dialog box. Click the note icon in the text to open the note. Select the word(s) to attach it to. Click OK. The note is attached to the word(s). Type another comment if necessary. Click in a notes window. Filter the list as desired. Click Yes to permanently delete you comment. If there are more comments, continue to delete the next comment. Choose the status, tag, person and date as desired. Define the filter as needed. Click in the textbox at the top left. Contributors to this page: jbeadle and matthew_lee . Page last modified on Monday March 18, 2019 06:13:35 GMT-0000 by jbeadle.